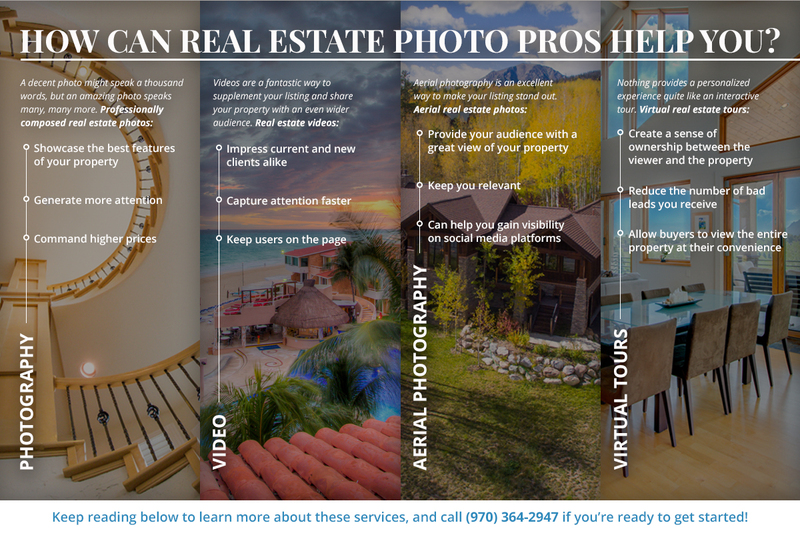 Real Estate Photo Pros is proud to be the real estate industry’s go-to team of professional photographers in Colorado. 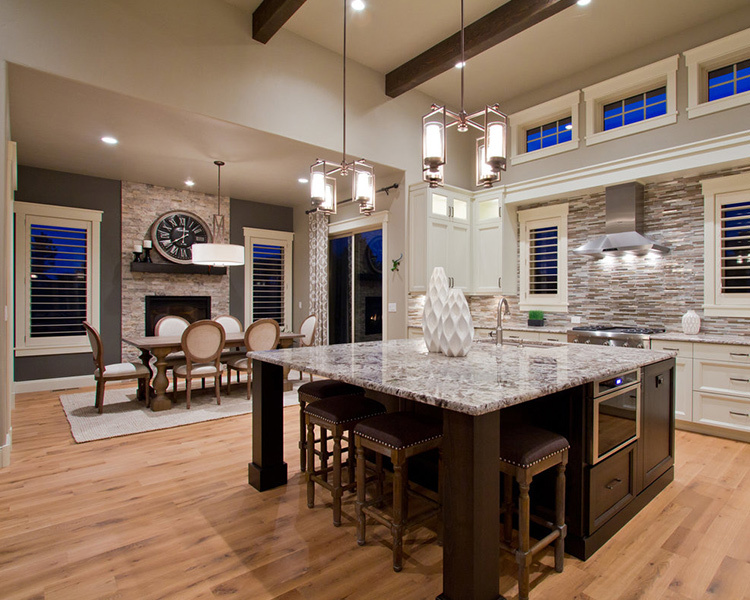 Serving Loveland, Fort Collins, Denver, Colorado Springs, and the entire Front Range area, we’re committed to helping you showcase the most attractive features of your property at an unbelievably affordable price. We even have two convenient ways for you to pay, which you can learn more about here! You can read more about our Colorado real estate photography services below, and you can get in touch with us by filling out our short online contact form! A decent photo can speak a thousand words, but an amazing photo speaks many, many more. If you’ve ever looked through the real estate listings on some of the most popular websites, then you’ve probably noticed that the majority of the photos are blurry, taken at odd angles, too dark, too light, or simply aren’t composed well. Even if you can’t quite put your finger on the problem, you know a bad real estate photo when you see one. With the majority of real estate searches performed online, you can’t take the risk of a bad photo album compromising your chances of a sale. Moreover, many potential buyers reside in other cities and states, and you need to create a great first impression from the moment they see your listing. Buyers have an endless supply of listings to look through, and if yours doesn’t stand out, then they can simply move on to one that does. Real Estate Photo Pros is here to provide you with the professional and well-composed real estate photos you deserve. From the composition to the lighting, we’ll make sure that everything is perfect so that you can spend your time focusing on the many other tasks required to sell a property. If you have a large property, or if your property is located in a beautiful neighborhood or subdivision, then you should consider investing in aerial real estate photography to supplement your listing. We provide professionally composed photos taken via aircraft or drone that provide your audience with an all-inclusive view of the area. In addition to setting your listing apart from the competition, an aerial photo album can also generate many more high-quality leads. You can read more about this fantastic service below! While high-quality photos can make your listing appear more professional and attractive, videos are a fantastic way to supplement your listing and share your property with an even wider audience. Think about it this way: If you’re searching for a home, then you’re probably not spending more than two or three minutes on each listing you view. Buyers are busy, and they may not have time to sift through each and every photo you provide. Given this fact, you need to catch your viewers’ attention and get them engaged with your listing as quickly as possible, and videos and virtual tours do exactly that. At Real Estate Photo Pros, we know that adding engaging and beautiful video content to real estate listings is a tried-and-trusted method of generating more interest in a listing. Viewers love being able to see different angles and feel like they’re actually walking through your property, and this can also help to create excitement and anticipation before an in-person tour. So, whether you want to provide your viewers with a panoramic shot of the backyard or you would like to take your viewers on a journey through the interior, our real estate video services are the best way to show your audience why they should be interested in your listing. If you would like to learn more about our real estate video services, then please don’t hesitate to reach out to us! A friendly member of our team will be more than happy to help you find a package that suits your needs. High-quality real estate photos and videos are essential if you want to create a compelling listing. If you’re looking for a way to make your listings stand out, consider investing in aerial photos by Real Estate Photo Pros. In addition to showing off your property in a unique and compelling way, aerial photos can actually help you command a higher asking price! It’s true — numerous studies show that buyers are willing to pay more for a property if the listing features professional photos, which makes aerial photos among the most impressive assets you can include in a listing. Still not convinced that you need to invest in drone real estate photography? Here are a few more reasons why you do! You’ll stay relevant: Keeping up with trends is important, especially in the fast-paced real estate industry. Believe it or not, at one point in time, many real estate agents were reluctant to use the internet to promote their properties. Today, real estate searches are almost exclusively done online! More and more real estate companies are utilizing aerial real estate photos to entice and educate their buyers, and you don’t want to be left behind. Stay proactive and let Real Estate Photo Pros help you stay ahead of the game! You’ll provide more information: As we mentioned in the previous section, many buyers won’t be located in your immediate area. They may reside in other counties, or they could live in another state entirely. While your professional real estate photos and videos will show them the inside of your home, they may want to know what the property looks like within the context of your neighborhood. Aerial photos will show buyers exactly what your property looks like from above, and you’ll also be able to give them a better view of the entire neighborhood. You’ll be more visible: You’re investing in real estate photography for marketing purposes, and you need to be able to leverage your investment across multiple platforms. Are you using social media accounts to promote your properties? Build your following and boost your online presence by uploading impressive aerial photos that make you stand out from the crowd! You’ll impress future clients: As a real estate agent, you’re always trying to attract more clients, and having an impressive portfolio is one of the best ways to garner more business. If you want to show potential sellers that you’re serious about helping them sell their property quickly, high-quality aerial photos might be just what it takes to prompt them to call you instead of another agent. While real estate photos, aerial shots, and videos of your property can all increase your visibility and improve your chances of a quick sale, nothing creates a personalized experience quite like a virtual real estate tour. You can show potential buyers what it would feel like to wake up in the master bedroom in the morning before walking downstairs to make coffee, or you could start the experience by showing them exactly what to expect when they walk up to the front door for an in-person tour. User-friendliness: One of the best features of virtual real estate tours is that they’re highly intuitive and simple. You can never anticipate whether or not your audience will be proficient with the latest gadgets and applications, but point-and-click virtual tours make it easy for anyone to learn more about your property. This ease-of-use allows you to market to any demographic! Increased engagement: We previously mentioned that videos will keep users engaged with your listing longer than photos, and a virtual tour will almost certainly keep them on your page for even longer! Viewers can navigate from room to room as they explore your home, allowing them to easily find the information they need. Sense of ownership: Psychological studies show that when you’re marketing a product, the longer a viewer spends picturing themselves owning it, the more likely they are to make a purchase. Of course, you’re marketing a property instead of a product, but the same principle applies. Virtual tours allow potential buyers to develop a deeper connection to your property than they otherwise would, which may be just what it takes to get them to reach out to you. Fewer bad leads: As a real estate agent, you understand that some of the tours you give will never lead to a sale. That being said, you can leverage the power of virtual tours to minimize the number of dead leads your listing generates. Buyers will be able to see more of your property and have more information before they reach out to you for an in-person tour, which increases the likelihood that you’ll receive inquiries from serious buyers. Availability: Like you, many potential buyers work long days. They have other responsibilities to attend to when they’re done at work, and this often prevents them from reaching out to schedule an in-person tour. However, offering them the opportunity to take themselves on a virtual tour means that they can view your property at any time of the day. They’ll reach out to you to schedule an in-person tour at their convenience, but they’ll have most of the information they need after going on a virtual tour! Pay Later: This plan allows you to defer your payment until you sell your property. If you are unable to sell your property, or if you lose the listing, then you owe us nothing! This plan is a low-risk way to secure the real estate photo and video services you need without straining your budget. Pay Now: You can save 30 percent on all of our everyday real estate photo and video packages if you pay in full at the time of your order. This option is ideal if you are confident that your listing will sell quickly, or if you would like to minimize the cost of your listing. As Colorado real estate photographers, versatility is the key to our success. Colorado has a fast-paced and dynamic climate that precludes a one-size-fits-all approach to photography, and we’re proud of the fact that we can take shots at any time of the day in any season. Moreover, our services don’t stop where the camera lens ends. We can help you create video slideshows, flyers, and other creative ways to engage with your audience! We know that many of our customers have needs that may not be listed on our website, so just ask us about other ways we can help you improve your listing during your consultation. At Real Estate Photo Pros, we believe that the little details matter. From finding the perfect lighting to experimenting with different angles, our mission is to provide each and every one of our customers with jaw-dropping photos and videos. We also take pride in our prompt communication and fast turnaround times. We know that the real estate industry is fast-paced, and we’ll always strive to complete your order as soon as possible. Take a look at our portfolio to see the photos, videos, and virtual tours we’ve done for previous clients! As a real estate agent who has probably taken real estate pictures more than a few times, you know how time-consuming the process can be. Moreover, you know how frustrating it can be when your pictures don’t turn out well, or if your listing doesn’t garner the attention it deserves. Instead of trying to make time in your busy schedule for photos, videos, and virtual tours, let our Colorado real estate photographers handle the entire process for you. You’ll have more time to focus on your clients and other listings, and you’ll also build a track record that will impress future clients. Plus, you’ll maximize your chances of selling your property quickly! Are you ready to get started with real estate photos, videos, tours, or any of the other services we offer? Contact our Colorado real estate photographers through this page, or fill out the form below now to get started!